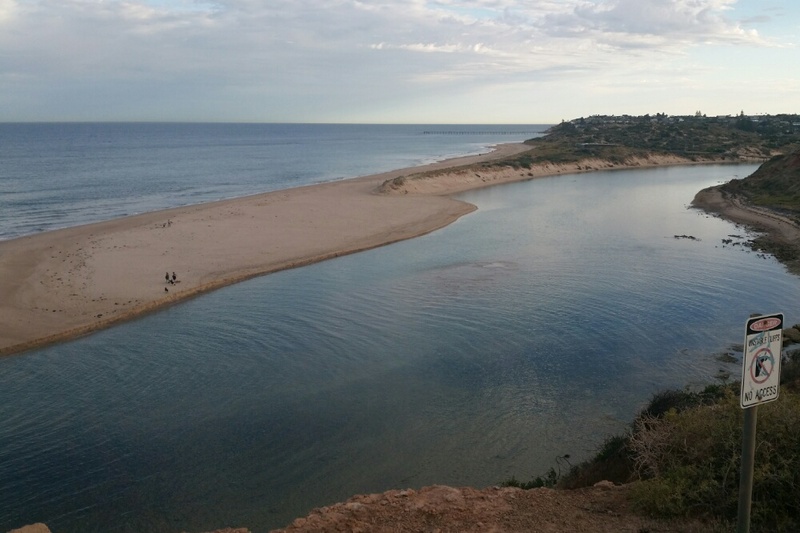 The Autumn weather has arrived and we had expectations of a nice swell rolling up the coast with light winds giving almost glassy conditions for our Friday Surf Kayak paddle. Before dawn the wind was perfect with just a puff from the north, but as the first rays crept over the hills we knew Surf Kayaking wasn’t to be. The swell from the last couple of days had dropped; in fact it had disappeared almost completely. 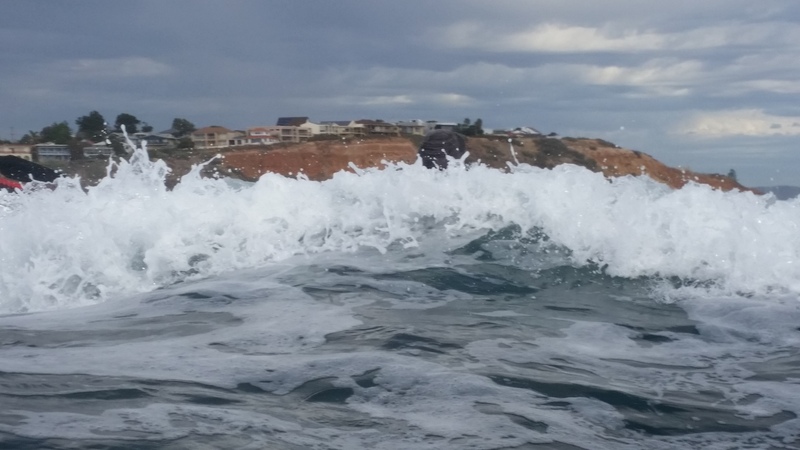 It was some consolation that we enjoyed a great surf session on Wednesday, and that we could paddle our Sea Kayaks out to our local bommie for a bit of fun today. Standing on the cliff we were greeted by a gently lapping sea but further out the tide was right for a few waves exploding over the bommie. Yep; it has some quite shallow spots were the reef is only 20cm or so below the surface and the trick is to avoid finding those rocks, especially with the sea kayak bow or your head. The edge of the bommie was quite sedate while we waited for a larger set of waves. Scouting around the edge of the bommie. It looks pretty sedate here. We made a number of runs through to the outside of the bommie and managed to grab a few good rides as the waves pitched up over the shallows. 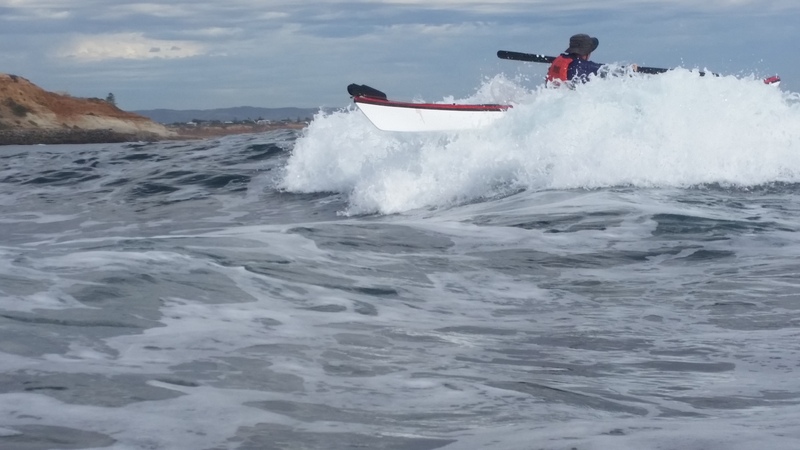 A couple of rather desperate support strokes saved the day as the kayaks ploughed under on the steep waves and then bobbed up again only to be buried again by the white water. As the tide flooded over the bommie we played in a place where 2 waves meet causing an explosion of water and some seriously powerful turbulence. Then he was buried by the foam pile. Can you spot the hat and the piece of red kayak ? It certainly wasn’t a wasted 2 hours on the water. Lots of support strokes, frantic back surfs, buried bows and two wet but happy paddlers. Steve not only managed to get some great photos whilst staying upright but was the only one to “kiss the reef” with his kayak. Like to join us ? You’re welcome to come along as we always need more ‘crash test paddlers”. 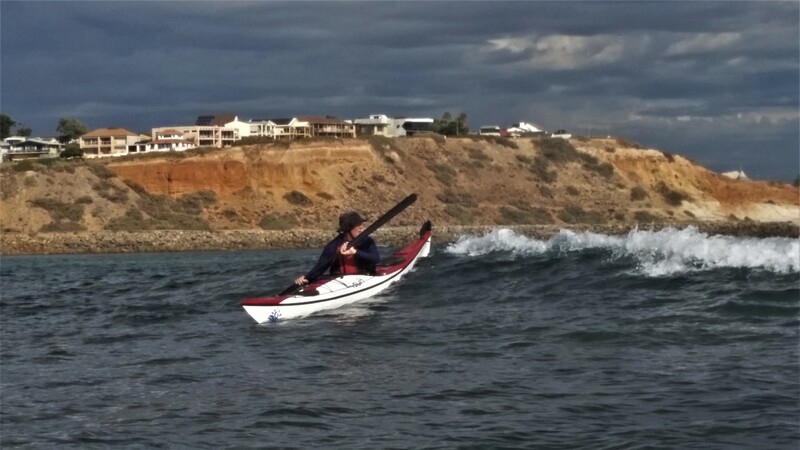 This entry was posted in Sea Kayak. Bookmark the permalink.